Nail hygiene and care is essential to maintain the health and appearance of the feet. Incorrect nail care can result in many painful occurrences and lead to an infection developing. Keeping the nails short and tidy can help to prevent these instances arising but it is important to know how to cut the nail properly. If you do not have any proper nail clippers it may be tempting to use scissors or even just to ‘pick’ the nails to keep them short but this practice is not advisable as it can damage the integrity of the nail and also cause pain and risk an infection developing.First of all it is important to select the most appropriately sized clippers for your own nails.Young children should not use adult sized clippers as this may causer the nails to become too short or may risk endangering the skin surrounding the nail itself.The clippers should also have a suitably sized working device or handle that you are comfortable holding yourself. If you have difficulty holding small items or find it hard to make fine movements such as those required when using nail clippers, it is advisable that you have your feet attended to by a professional foot care specialist such as a chiropodist. As in many families nail clippers are shared items within the home so it is important to keep the devices clean and free form bacteria and fungal spores.The clippers should be washed in warm soapy water after each use and dried in order to prevent build-up and deterioration of the metal.Always make sure the clippers are clean before use and that the blades are straight and not damaged in any way. 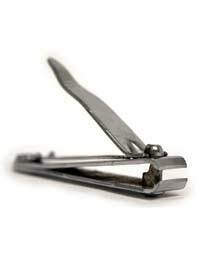 When using the nail clippers make sure you are comfortable and can reach the foot sufficiently. Using one motion cut the nail straight across and remove the piece of nail from the area.Although it can be tempting to clip the edges of the nail which can be sharp it is advised that these edges are smoothed down using a nail file. If the corners are clipped they can become sore and put the nail at risk of infection. There is also some research which suggests that by clipping the corners they may be more inclined to become in-grown as the nail grows back. Many people find the nails easier to clip and manipulate if they have previously been soaked in hot water so the best time to cut your nails is after a bath or shower as the nil will be softer and they will be clean.Don’t forget to discard the nails and wash the clippers are use.Always store the clippers somewhere safe and away from young children who may be tempted to copy you and try and cut their own nails. If you have an existing infection it is vital that the infection is not permitted to spread. When you have finished using the clippers wash them in hot soapy water and change any towels or covers that have been in contact with your feet. Adequate nail care is very important for infection prevention and to improve the appearance of your feet.Using nail clippers is the best method for trimming nails especially if the correct procedures are followed and hygiene is adhered to.